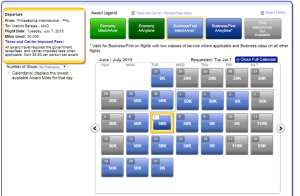 Business Class availability on PHL-MAD route in July for 6 tickets. US Airways is offering six or more seats in both business and economy class on many of their routes to Europe and Israel this summer. The airline flies to a number of cities in Europe from both Philadelphia & Charlotte. Connections can also be made with their OneWorld partners. Usually deals like this do not last long. Awards are bookable on both the US Airways and American Airlines websites. For more details see this Miles4More post.